What a finale! If I ever was enthusiastic about Robert Wilson’s Javier Falcón series, the final book tops it. 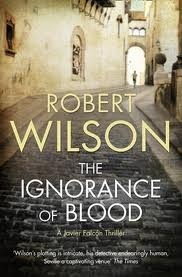 With The Ignorance of Blood Robert gives a conclusion, not only on a thrilling final case, but spanning over the whole arc on the Inspector Jefe from Seville. What began as an intertwined story on discovering himself, very personal and close, the fourth and final book on Falcón in the end returned to be just very that: personal attached to Javier and his life. This book actually gets started with a bit of “luck”, when some russian Mafia courier died in an accident putting some million Euros and highly critical material in the hands of Seville police force. The investigations on this courier and material lead into several situations, causing threat and death to people involved in the bombing set up (the core case of The Hidden Assassins). In parallel, Javier is struggling with his very close friend Yacoub Diouri and him being in between intelligence services and a terrorist cell. Robert builds up the tension very well, deceives his main protagonist as well as the reader, not using any writing tricks but by presenting an intelligent story that is build on multiple threads, sometimes intertwining but then again not. One can read, how the figures in the book develop on their own and surpise the reader quite often, without losing their credibility or stretching the story’s plausibility. Of course, there is quite some luck involved in pulling the plot as it is, but to a reasonable amount, at least to me. Except that the ending did leave me a bit unsatisfied. And while it seems final, it still has an openess and potential for a future. This tetralogy grew to one of my favorite novels in the thriller genre. I very much enjoyed the way Robert Wilson put on the plots and his style of writing, I’ll surely get hold of the other novels he wrote. Great job, Mr. Wilson.